Place potatoes in a Dutch oven; add water to cover. Bring to a boil. Reduce heat; cook, uncovered, 10-15 minutes or until tender. Meanwhile, in a skillet, cook bacon over medium heat until crisp. Remove to paper towels with a slotted spoon; drain. Drain potatoes; return to pan. Mash potatoes, gradually adding cream cheese, sour cream and butter. Stir in milk and seasonings. Transfer to a greased 13x9-in. 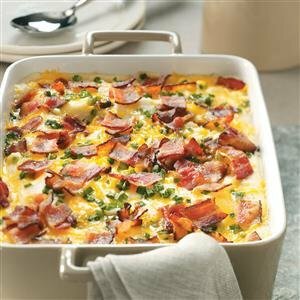 baking dish; sprinkle with cheese, green onions and bacon. Refrigerate, covered, up to 1 day. Preheat oven to 350°. Remove potatoes from refrigerator and let stand while oven heats. Bake, covered, about 30 minutes. Uncover; bake 10 minutes more, or until heated through. Makes 10 servings.